Ever wonder how improvements in productivity affect production and trade? Ever wonder what enabled globalization to spring into existence is a short period of time? How does innovation work? How does "unintended consequences" work for the good as well as for the bad? How does innovation displace government restrictions and regulations with freedom and trade? 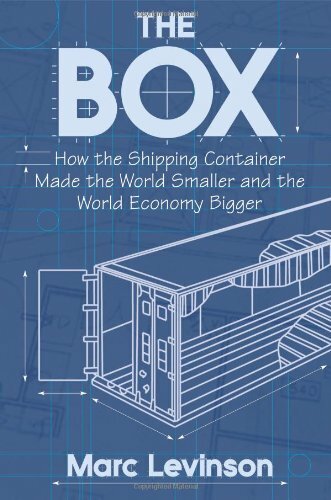 The Box explains how containerization, which began in 1956 and slowly spread around the world, captured the world's exporters and importers with a burst of productivity during the '90s. Containerization ... began as a means of shaving a few dollars off the cost of sending Malcolm McLean's trucks between New York and North Carolina. At best, it was regarded as a minor innovation, "an expedient," as one naval architect opined in 1958. ... They were deemed impractical for most types of cargo and for shipments to distant places, such as Asia. Absolutely no one anticipated that containerization would open the way to vast changes in where and how goods are manufactured, that it would provide a major impetus to transport deregulation, or that it would help integrate East Asia into a world economy that previously had centered on the North Atlantic. The history of containerization bored those to whom Levinson talked while he was writing the book. After its publication, readers were absorbed in the economics and history of the industry with facts that no one knew had occurred, yet it was in front of everyone's eyes. Containerization has reduced the cost of shipping products so much, that transportation costs are virtually ignored today in the cost of doing international trade. It used to be that upwards of 25 to 50% of the cost of imported goods was due to transportation. Containerization has eliminated dock workers directly; but it changed the job structure in manufacturing and wholesaling, both in the US and abroad. No longer did one have to be near the docks to ship product. Political leaders, trade unionists, and corporate executives made costly mistakes because they failed to apprehend the container's influence. US Railroads fought containerization tooth and nail in the 1960s and 1970s, convinced that it would destroy their traditional boxcar business, never imagining that early in the twenty-first century they would be carrying 12 million containers every year. This book deserves the widest readership, especially among Objectivists. Thanks, Paul. I'll be getting it soon. Paul, it sounds very interesting and thank you for the review. If I may ask, who is Terry Malloy? He's the longshoreman played by Marlon Brando in On the Waterfront. Write to Craig Biddle at The Objective Standard and offer to write a book review. I would like to read the book since I played a part in the story. I helped design and build the container control and booking system for U.S. Lines, a major international freight shipping company. I remember how complex such an operation is and what an accomplishment was to implement it. The assertion that shipping costs were virtually ignored in shipping post containerization is only half true. The real innovation in shipping was the iron hull which allowed larger ships to carry more further and more safely in the early 20th century, allowing the industrial revolution to shift into the next gear by allowing virtually all foods to be grown elsewhere, thus bringing farmers into towns and allowing for large population expansions. More in the excellent Merchants of Grain. Otherwise, it looks interesting and I will surely pick it up. While this is true to some extent, I think it's a rather simplistic view (though I'm sure you know more about industrial revolution economics than I). The iron hulls were used for the first half of the 20th century in the liner and tramp trades, which were nowhere near as efficient or cost effective as the container ship. It was the post-WWII increase in labour costs and the development of reliable land-based technologies (such as automation of cargo handling) that allowed the mechanization of sea transport. Another major impetus for the container ship was the post-war removal of restrictions on the colonial systems, providing access to global market (particularly raw materials) that had previously been restricted. Former European colonies were encouraged do away with their isolationist policies, open their borders to trade, and ultimately develop an export-based economy. This led to a large increase in the oil industry, resulting in crude oil being shipped to refineries located near the market. Thus, the idea of economies of scale in the shipping industry was first tried by the bulk transport industry - oil tankers increased in size from ~16,000 dwt pre-1950s to ~125,000 dwt in 1960! But ultimately, it was the advances in communications and information technology that allowed containerization to occur, to which I'm sure Betsy can attest. As a naval architecture student, it is interesting to understand that ships as part of a small piece of the transportation system (particularly because I designed a containership for my capstone ship design project). The new ships will be 1,312 feet long, 193.5 feet wide and 239.5 feet high, longer than a modern aircraft carrier and bulkier than an oil tanker. They will be able to carry 18,000 20-foot containers, 2,500 than the largest class of container ships now in service, which are also in Maersk's fleet. The line said the ships will generate 20% less carbon dioxide per container than its current ships and 50% less CO2 than "the industry average on the Asia-Europe trade lane." The ships also are expected to consume 35% less fuel per container than those now running containers between Asia and Europe. Anyway, Paul, thanks alot for the book recommendation. You're welcome. The book does not deny that there are many factors involved in creating the modern shipping industry. But it was the business model that McLean established, of which the container was an essential part, that moved the industry forward. He was not the first to use containers. He was the first to put in place the idea that all elements of the business should be aimed at moving goods from producers to consumers, and every element of the transportation cycle needs to be maximized for profit by reducing costs. And the container was the essential element in reducing transportation costs, at one point form almost $6 per ton to about $0.25 per ton. He and his engineers integrated containers to ships to fit properly and maximize space; made containers fit right onto trucks and railroads cars without the need to take out all of the goods by longshoremen and transport them into different containers. His ships were designed with huge cranes on the ship so that the containers could be unloaded in ports without land-based cranes. He arranged to have containers waiting at the port where the imported goods were to be unloaded so he could bring back goods to the original location without having to go back with empty containers, reducing cost significantly. Let's also remember that the transportation industry was heavily regulated: railroads, trucking, shipping, unions. His business model was so ingenious that he was able to get around all the regulations and succeed. Oh no, my reply was simply to rtg24's suggestion that the "real innovation in shipping was the iron hull." My point was mainly that the iron hull had been around for well over a century before containerization took place. It sounds like a great read - I'll definitely pick up a copy and read it when I have time. PS: Containerships have moved away from cranes on the ship - it's much easier nowadays to maximize the space for containers aboard the vessel with dockside cranes. Just in case you weren't aware of it. Yes, I'm aware of that. At the time, in the book, there were no land based cranes to remove the containers, at least not in the ports where McLean was sending his ships. Containers had been around for decades also. But McLean figured out what to do with them and make it profitable. Reminds me of a lesson in Good to Great by Jim Collins (dunno if you've read it, but I thought it was a good, researched-based business book): the most successful company isn't the one that uses a new technology the fastest, it's the one that integrates technology into a rational business model that fits with the central purpose of the company. Made sense at the time, but it's always nice to get an external validation. I have very little experience with the business side of things, but so it is interesting and useful to know which books are worth the time. Thanks again for making me aware of this one, Paul. There are times when I feel I should put something up for review, but then I forget or don't feel like taking the time to write the review. So I appreciate the effort on your part. I thought it was Louis Dreyfus that first used cranes on their bulkers? On the four pre-WWII 'L-D' ships. My previous point was really from the point of view of a commodity trader. It was when - again - Louis Dreyfus and Bunge started using iron hulled bulkers that freight was no longer prohibitively expensive and indeed cheap enough that US wheat and corn could be sold in Europe, thereby financing the Western expansion and budget surplus that helped the US economy take off as it did pre WWI. I thought I'd share some quotes from the chapter on unions. These are from the last 1950's to early 60's and what was happening with the longshoreman's unions. Perhaps someone wants to explain what unions are good for. Shippers were starting to send their export cargo to the dock already tied on wooden pallets, intending that the entire pallet be transported as a single unit. Since pallets were easy to move with forklifts on the pier and to stow with forklifts inside the ship, the Shipping Association asked the union to handle them with gangs of only 16 men at each hatch, rather than the normal complement of 21 or 22. The ILA quickly did the math: the companies’ proposal could mean the loss of up to 30 jobs on a vessel with five hatches. The union objected, and the Shipping Association retreated. With tensions mounting, the ILA stopped work on November 18 and convened twenty-one thousand longshoremen at Madison Square Garden to hear about the threat of mechanization. Union leaders demanded that employers “share the benefits” and insisted that they would not accept smaller gang sizes. It [the union] offered to eliminate one or two longshoremen from each gang. In return, it sought a six-hour workday and a requirement that every container, whatever its origin, be “stripped and stuffed”—that is, emptied and then reloaded—by ILA members on the pier. One formal rule provided that, once assigned to a job at a particular hatch of a particular ship, a worker would do only that specific job until the ship sailed; if loading was complete at one hatch but not at another, an idle worker from the first hatch could not be shifted to help out at the second. This reminds me of Apple's business model that befuddles so many people who work in the computer industry. Some people simply cannot grasp how Apple has succeeded so well - especially in the past decade - even though their products aren't feature laden or up to the bleeding edge specifications. What many people fail to take into account is Steve Jobs has always stated that Apple designs their products with users in mind. It's astounding to see so many people take to the iPad, for example, in ways they never did PCs or even seemingly similar tablet like devices. From a topological p.o.v. the container has turned the inside of a ship into its outside. The containers sit on the decks, ready to be unloaded. In the old days, the cargo had to be placed on pallets and hauled out of the holds by cranes. In addition to being time consuming, handling cargo by the pallet load was a temptation to petty theft by the longshoremen. A pallet load of booze (in crates) is hauled up and "accidentally" tilted. Down go the crates. The longshoremen help themselves to the bottles of liquor that have survived the fall. The shipment is written off as a loss and the insurance companies pay for the damage. Containers (properly locked and custom sealed) are less of a temptation than open cargo on pallets. Fixed spelling. Misspelling was so funny it was distracting.